Urban Initiatives – Three Cheers for UI Volunteers! Three Cheers for UI Volunteers! We had some incredible volunteers this Fall, many of whom have made a lasting impact on their teams, so I just wanted to spend some time to highlight a few of our all-stars this season. 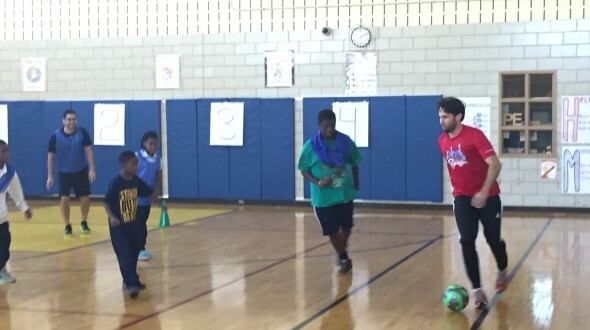 Our furthest traveller comes all the way from Germany, and he dedicated three days a week of his stay in the States with Jordan Elementary in Rogers Park. He taught the kids a few moves from the Munich team, and a few words in German, but says that her learned far more from the kids than he expected. 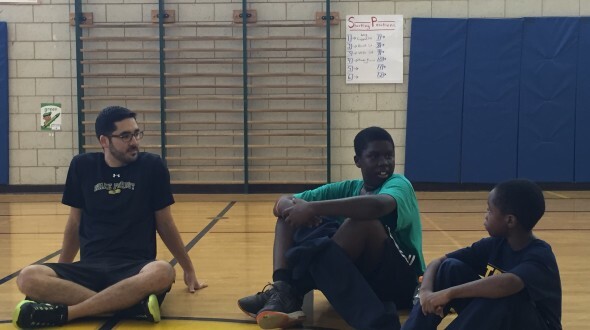 Three of our longest standing volunteers were back at Otis and Jenner this season – Seth, Joel and Brian. When the Team Captains saw these guys from the window of the cafeteria, they screamed “I knew you’d be back this season!” right before bolting up to the gym to show off some new moves they learned over the summer. Emily and Alex have also been volunteering on the Jenner team before work, and both plan to come back in the Spring Season. Two of our volunteers, Maegan and Victor decided to double down on their commitment to Urban Initiatives by both continuing to volunteer at 7am and by joining our Junior Board to help us expand our reach to more students. 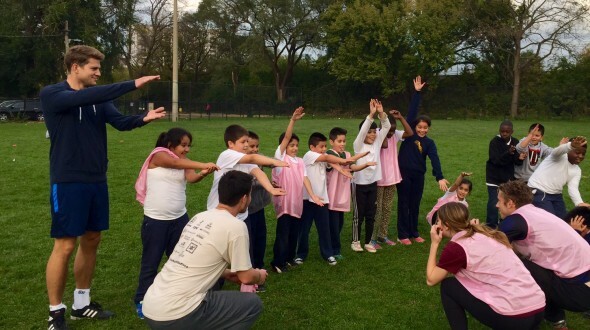 Maddy joined the Howe team from a professional soccer background, and Coach Eugene said her positive energy really helped motivate everyone to try their best. 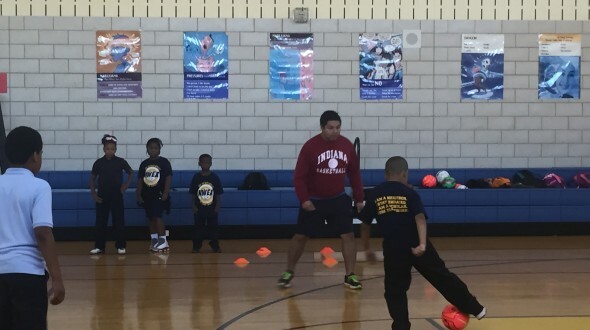 Emmanuel joined the Lorca Orcas and really enjoyed learning more about sports-based youth development. 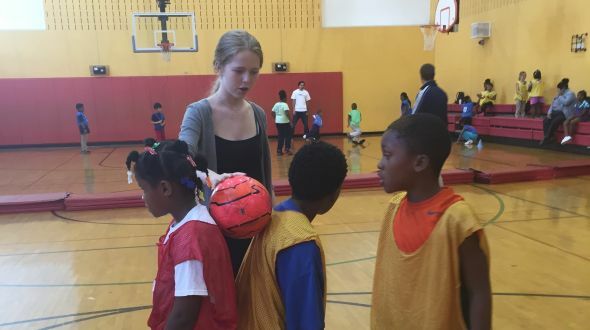 Kristen, an elementary school teacher at a different school joined the Greene team to see how sports can be used as a hook to get kids excited about academics, and Roger joined the Providence Englewood Charter School team to give back to a community near where he works. We also had two wonderful volunteers from Loyola, Lizzie and Dane, join the Jordan team as part of their studies in sports psychology. Lastly, a member of our Student Board, Maria, volunteer at National Teachers Academy. She enjoyed telling the students about her aspirations to work at CERN as a physicist and share her passion for STEM with her teammates. A huge thank you goes out to all of our other parents, family members, school staff and community members who volunteer on our teams, come support our players at Friday Game Days, and reinforce UI’s academic, health, and character lessons on and off the field!